You may browse the latest Aldi Catalogue which covers the Special Buys Weekly deals. The current products are available in the catalogue where you can see all these special buys. Aldi’s product range is uniquely chosen and they are only available 2 days week. They have not a great number of stocks when they bring these products. Anything can be a subject of an Aldi Catalogue. An HD TV, laptop, game console, toys of popular movie characters and numerous more. If you are familiar with Aldi stores, it’s easy for you to spot a good deal in the catalogues, too. Follow our Facebook or Twitter page to track the future Aldi deals and special buys weeks catalogues. Moreover, you may share your opinions about stores and reviews here. Discuss the deals, check out your favourite products online. 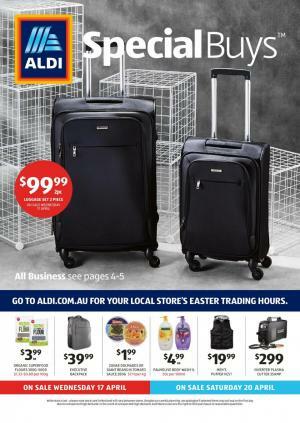 ALDI Catalogue Special Buys week 13 with bathroom products, indoor home entertainment, electronics, Easter products e.g. chocolates, kitchenware, kids clothing variety for new season, ALDI Catalogue 7 day deals and more products are now available for visitors. View full coverage of the latest ALDI cataogue for saving. Moreover recipes that are popular and favorite for the products you can find on the latest catalogue. You can shop for these products on the official page of ALDI. Here catalogue products are viewable just for this week. Also check out the archive to compare prices because most of the products of ALDI were available on other catalogues. Utilize this catalogue on your own with savings. Best deals of ALDI are of course the Special Buys. I am very impatient to see softness of the touch of these products. You can view them on pg; 5. Improve the joy of entertainment set in your living room with suitably priced products of electronics section of latest ALDI Special Buys Catalogue. Very good selection by editors of ALDI catalogue are featured on new exhibition online. Ferrero Rocher, Cadbury, Lindts are featured brands of ALDI Catalogue March third week. Easter sale is one of the best in this month. View full of the ALDI Catalogue on this section. To see more deals that are sale on 28th March go to pg; 12 where new ALDI Italian food products are available. Olives, cheese variety, European chocolates and similar products from Italy are viewable. Also see kitchenware on pg; 14&15. Kids clothing on pg; 16&17. ALDI Catalogue special buys week 12 has got a unique sale. ALDI offers new sleepwear in winter. ALDI prices for new sleepwear products are so low that I am sure you will love. Please got to pg; 2-5 to see new sleepwear sale of ALDI that you can shop on Wednesday 18th March 2015. Socks, slipper, pj sets, and similar sort of products are sale on new ALDI Catalogue. ALDI Catalogue special buys week 12 offers fish variety. This new seafood sale of ALDI is on sale 18th March, WED. Packed food of seafood products from the best places. You can reach an amazing sale of ALDI with the best of seafood products. ALDI outdoor items have always been among the most popular products. Special buys of sleeping bag, portable cooking products or BBQ type products are sale on this section. ALDI offers low prices of Adventuridge that produces ones of the best outdoor items. You can shop for these products on Saturday 21st March. See many more of outdoor items which you will probably need in every phase of your journey in nature. Cookware, food storage, camping products and electronic accessories to make your activity more enjoyable. These products are like professional that you can use for every kind of camping activity. Shop for these products on 21st March 2015. Solar charger, binocular, nigh vision device and similar electronics and hand gadgets to capture the zone you want to settle are sale on the Sat, 12th March. Sweetest Easter chocolates sale on 11th March in stores of ALDI are available on new catalogue. Easter chocolates ALDI catalogue March 2015 is for you to save big amounts of your money. Don't spend a fortune in every feast. ALDI does exist for this purpose. Customers love ALDI to shop for this kind of products. ALDI allows you to reach a good range of products of Easter chocolates on new ALDI catalogue. Brands of Easter chocolates are the ones you loved. Luxury products of these chocolates will add a color to your day in Easter. Make children happy with sweet Easter products of ALDI. Don't miss out these products and remember the date of sale is 11th March. This Easter will be best day in your March for this sale is so good offering you everything to celebrate. Choceur bunnies are also sale for $5.99 pk. The new sale of ALDI catalogue sells garden products, kids clothing, plants, painting supplies and paints, Work Zone power tools, ALDI Expressi and fresh meat products. 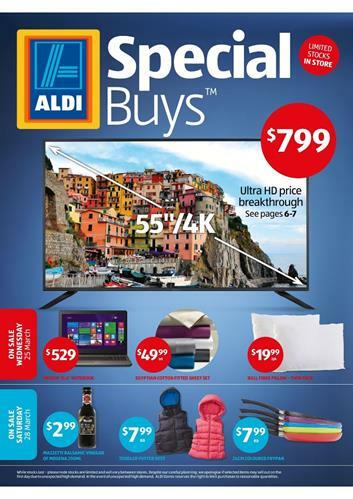 7 Day deals are available on the end of the ALDI catalogue. You can purchase great products from grocery department of ALDI this week. ALDI Catalogue special buys week 11 sale is available with new kitchen products, kids clothes, cleaning supplies, Easter chocolates like chocolate bunny and these are available on 11th March 2015. Other sale is valid on 14th March 2015 which offers gardening products, plants, painting supplies, and some power tools. In new season products of ALDI kids clothing you can find Lily&Dan. Colorful options for kids' clothing in March 2015 are featured on the new special buys ALDI catalogue. Go to pg; 2-3 for the sale of 11th March. ALDI special buys week 11 offers kids clothing. ALDI catalogue mostly has good prices for kids clothing. Similar to this ALDI Catalogue we can see regular options of kids clothing. Today you are able to see a retro style at ALDI Stores. Top quality products of kitchen wares for March 2015 are sale at ALDI. While you set up a nice kitchen you also save a significant amount of budget of yours for shopping for this kind of products. Power Force cleaning products like mops, plastic product, some chemicals, household items and similar sort of items can be found on pg; 6&7. See many more on these pages. Easter chocolate variety are featured on new ALDI special buys catalogue published in this week. You can shop for the items of Easter chocolates on WEDNESDAY 11th March in store. New sale of garden products are addressing you with decorative accessories, handy hand tools like trimmers and accessories like gloves. Handle your garden with simplicity without spending a lot money. ALDI Catalogue special buys week 10 is available on preview page. They got new two sale on 4th March and 7th March. This week ALDI offers specials for ladies. Skin care items and underwear products are available on new ALDI Catalogue. Lacura skin care formulas will prevent your skin from aging. Another special sale of Aldi is musical instruments. Acoustic guitar, electro guitar, electric drums, accessories for these instruments can be purchased at ALDI stores. Also see new ALDI Easter chocolate sale. Chocolate bunny, Easter eggs and very special prices of various chocolates are featured on new catalogue. 6 pages are full of Easter sale. These products are all sale on 4th March. The sale on 7th March includes ALDI fitness and sports products biking products, sports supplies like Crane's wristband, blood pressure monitor etc. And also you will be able to shop for vacuum cleaners that are real powerful devices to clean at most efficiency. ALDI groceries, 7 day deals were also contained on this new ALDI Catalogue. Underwear and Lacura cosmetics are featured by new ALDI special buys. See them on pg; 2-5. Socks, shoes, high quality sleepwear and underwear. Electro guitar, drum, and various accessories to use with them are featured on pg; 6&7. And many more products are sale on 4th March, WED.
Easter eggs, chocolate products, chocolate bunny and colorful Easter eggs are new sale by ALDI. Check these out on pg; 8-14. We will go on with sale of 7th March SAT with next post.